During my regular RSS feed browsing I noticed Sue Harper announcement of Early Adopter Release of Oracle SQL Developer Data Modelling tool. This is really a good news. We used to be a vivid Designer/Developer shop in the past but we left this Oracle technology track in 6i time frame. Rightly so, considering that only Oracle (“a damage control section of it”;-) itself believes in long Developer/Designer prospect – let’s face it, both product lines are dead, we should not pretend to believe otherwise (and yes, I read Oracle white paper – State of direction and I still think the same). What I miss the most are perhaps Designer ER modeling and Reverse Engineering capabilities. Not so long ago we tried Quest Toad Data Modeler which is not a bad tool. It’s cheap, relatively light (thought it can become a memory & CPU hog), easy to learn and use, supports all major RDBMS vendors and can do reverse engineering, but the competition never hurts. I just downloaded Early Adopter Release and tried a few things. What to say? I do like look and feel of OSDM, but it’s too early to do a fair justice to the product. What I do know is that the price is right ;-). Posted on 12.10.2008, in Blog and tagged blog, oracle. Bookmark the permalink. 2 Comments. 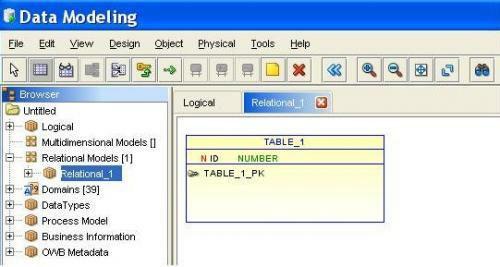 Oracle finally released production version of SQL Developer Data Modeler. Unfortunately, this tool is not free like SQL Developer. At the time of this writing the price is 3000$ per named user. A ridiculous high price considering competing product from the Quest. For the price of one Oracle Data Modeler we can get at least 4 user licenses for Toad Data Modeler. Needless to say that we’ll stay with the Quest :-). Oracle Data Modeler IS free! I was pleasantly surprised when I saw this announcement on OTN. I bet Oracle decision is a consequence of a the fact that people are not willing any more to buy everything they made for a price they want (DM was way overpriced compared to Quest Data modeler). Oracle Data Modeler was simply not selling, so the decision to release the product as free software was actually wise. Something not seen very often from Oracle Corporation.